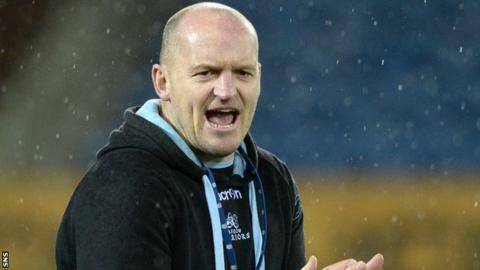 Gregor Townsend was full of praise for his Glasgow Warriors side despite their 13-10 defeat by Ulster in Belfast. A late Taqele Naiyaravoro try rescued a losing bonus point for the visitors. "An eight-point defeat is the worst you can get, knowing that you came close and were competitive but didn't get anything out the game," head coach Townsend told his club website. "We were down to 14 men and had used our entire bench but still managed to grind it out." Ulster's victory in what Townsend thought was Warriors' toughest game of the season took the Northern Irish side to the top of the Pro12. Reigning champions Glasgow are now 15 points adrift in eighth place, although they do have two games in hand. "I was proud of the squad overall, whether it was the young guys or the older, more experienced heads," said Townsend. "They really took the game to Ulster and that's what we have to continue to do in our upcoming games. "It was the ultimate test for us, but we fronted up very well and our scrum was probably the best it's been this season. "To score more tries than the opposition demonstrates the effort the players put in." Townsend praised 24-year-old fly-half Gregor Hunter, who made his first start for Glasgow since switching from Edinburgh in 2014. "Gregor has been out of action from pro level for two seasons through injury," said the coach. "He's played a lot for Glasgow Hawks this year and to get his first start away to Ulster when he's up against internationalists was a big test. "I thought he was very focused during the week and he was accurate during the match." Townsend was also pleased that Scotland back Peter Horne had made his return from injury as a second-half replacement.